Things I liked: Authentic weight, look and feel. One of 2 pistols actually made by SIG in New Hampshire, not an outsourced replica. Fantastic accuracy and plenty of power for a CO2 power plant. The patented CO2 loading mechanism is beautiful. What others should know: All in all wonderful gun that puts a smile on your face. I am an owner of the 9mm MK25 SIG. You wouldn't be able to tell the difference in appearance, weight or feel, unless knowing exactly where to look. I get about 3 full 16 round mags before noticing a drop off in power and blowback. Things I would have changed: Accuracy, trigger pull. What others should know: I tested in a Ransom rest at 20 feet. In 12 shots the vertical spread was 3 3/4 inches the horizontal spread 1 3/4 inches. This is such poor accuracy that the gun is not suitable for any kind of shooting. Trigger pull measured six pounds, single action. Things I liked: At 30 feet I don't have to aim and can put 7 rounds in 3.5 inches. It might take over a week to leak out a Co2 cartridge. Things I would have changed: Added a laser sight. What others should know: Best co2 pistol I've ever owned! Kilroy is right the laser sight is very valuable, I know I did add it with a light combination as well near the trigger, but I also installed an upper accessory rail and put a Ohuhu Red/Green Dot sight. Putting the Green circular symbol up and aligning the red laser perfectly sights this product in. Now with Viridian capabilities you can also change out the laser light combo and put a video capability on the trigger to view your shots as they happen. Either light & laser or Veridian Light & Video are excellent combinations to increase this products repeatedly increased accuracy, consistent performance, increased confidence of the shooter! In the end this will be competition ready with all the enhancements you can do. I titled my new combined accessories (OTET) on target every time! I am 64 years old, wear bifocal lenses and can now shoot 5 pellets directly through the center of a target! Imagine what a 21 year old can do with this! Things I liked: Nothing really. I don't think it's as nice as the X-Five that's sold for the same price. Yes, this is made by Sig in Japan. BUT, the slide feels and sounds very cheap. The X-Five model feels and sounds better. Also I dislike that the breach is closed. I use CO2 handguns to teach Cub/Boy Scouts gun safety. And one of the things is checking to make sure the gun is clear. You can't see on this one. Things I would have changed: Change the slide and breach to the style of the X-Five. Make it so it can be field stripped. What others should know: While it looks excellent and shoots fast, it feels kind of cheap. I think there are better ones out there. Things I liked: Really looks and like the real thing. that's about all I can say that's good about it. Things I would have changed: The CO2 loading is awkward, lacks power, can usually see pellets in air before they hit target. Not very accurate at all. It's a fancy toy. What others should know: Makes a great prop for a Halloween Costume but save your money otherwise, think they took some of the power to falsely simulate a blow back but it has the adverse effect of lowering the velocity and accuracy. My older older P225 made by Umarex shoots much better but is less realistic looking. I was very disappointed after recently purchasing their MPX rifle which is an absolut blast to shoot. Things I liked: I love its authenticity. For someone with big paws like me, it fits well in my hand. Even some of the drawbacks are accurate to the Mark 5 model like the button that releases the clip being too close and easily hit. Things I would have changed: The clip sometimes drops the ammo when I take the clip out to put away. Also, if I rapid fire sometimes all the rounds aren't shot. What others should know: Keep your thumb around the grip. Otherwise, you may accidentally tap the clip release button. However, that's in the design of the real Mark 5 as well. Things I liked: Accurate replica, right down to the weight (same as fully loaded "real" p226). CO2 changing system is brilliant... why didn't somebody think of this long ago? Prints fairly consistently (3/4" groups at 30'), although not where the sight picture would indicate point of impact should be. More about this below. Things I would have changed: Adjustable rear sight. Adjustable rear sight. Adjustable rear sight. Are you reading this, Sig-Sauer? Mine prints low and left; can't do anything about low, but the left should be adjustable by drifting the rear sight. Have to use entirely too much "Kentucky Windage" to hit the target consistently, and even then the groups aren't great because of the sight situation. Stronger spring on the mag release, or the mag pawl should engage more deeply with the mag, requiring a deeper press to disengage the mag (see below.) Lose the threaded barrel extension... who needs a fake silencer, anyway? Sleeve just keeps coming loose. I like to use this thing to pop bird-feeder-raiding squirrels with; I wish the magazine had deeper wells, so it could chamber some of the longer, pointed hunting pellets; the flat-faced and domed pellets pretty much sting 'em and bounce off, and they keep coming back. A pointed pellet would be a lot more effective. What others should know: Frequently fails to fire a pellet... go to reload an 'expended' magazine, and there's still a pellet or two in there. My particular P226 has a real 'hair-trigger' magazine release; when flipping the lever to "off-safety," it's way too easy to dump the mag inadvertently. Had to start using the off-hand thumb to work the safety. Frequent pellet jams, where a pellet slips the confines of the mag and jams in the well... VERY difficult to get the mag out when this happens. The knurled sleeve over the threaded barrel-end loosens up constantly; had to put loctite on it to get it to stay on. Tempted to just saw the foolish thing off... After changing the CO2 cartridge one time, at the first shot, the rear sight almost came out of the slide! I was surprised, as I thought it was cast-in-place, not a seperate piece. Used the opportunity to correct the windage so now it prints low, but in-line with the sight picture. Secured it in place with red loctite. Things I liked: Just so you know, I bought this at a local big 5 for $95 bucks but $103 w/tax. Now, it is a good gun, fits well in my hands which I would say are on the larger size. It's a full size pistol. Good weight too. I love how easy the Co2 change is, no twisting just open up and insert! Also the mag changes are quick, also the mag price is cheap! Things I would have changed: Obviously everyone would want it to be cheaper, but that goes for every gun. So nothing really to change! What others should know: Great gun for fun and no hasstle in the operation of the gun. Works great! Things I liked: Great realistic feeling gun, not made entirely out of plastic. I love the look of the P226 and I have to say, many of the features are a like. Things I would have changed: I would add better sights. A friend of mine dropped the gun and the plastic sights got crushed a bit but are still functional. Also I would add a more realistic magazine feature like the Sig Sauer P229 has. What others should know: The C02 seal is delinquent and shouldn't be used with Crosman C02 cleaner or else it will burst fire a shot or two and waste C02. This gun is mostly accurate for a C02 powered pistol, but 2-3 clips burn through the entire C02 cartridge. Things I liked: Feels like the firearm it mimics. Not a plastic knockoff. Fires well too, but not nearly as loud as the real thing. Much more convenient to fire than going to a pistol range. 44 shots per CO2. MUCH cheaper to own and shoot than the real thing. Safer too. Things I would have changed: Should have adjustable rear sights. What others should know: Youre gonna waste a lot of ammo. 16 rounds per mag (8 each side), so its easy to shoot a lot. Things I liked: Heavy, feels solid. Definitely a two handed pistol. Was well sighted out of the box. Things I would have changed: I'd like an alternative to the rotary magazine. The magazine is long enough to put many multiples of the 8 (x2) cylinder rotary capacity. What others should know: Buy extra pellets and a trap! It's really a lot of fun to go target shooting with. Things I would have changed: mags. are plastic when it jams and it will till you find your correct pellets ,will most likely break it so better get extra mags. What others should know: do not use heavy pellets! Things I liked: This is truly a fun gun to shoot. It's accurate and Sig did an excellent job of recreating the heft, feel,and shooting sensation of the 9mm that this model replicates. It packs a punch! Things I would have changed: I don't know if there is anything that I'd change. What others should know: Exercise caution around people and property as this is a powerful airgun. Things I would have changed: The blowback is a bit much for an air gun. it takes a few magazines to get acclimated to the motion and hone in aim. There are several knobs and levers that, if you own the real gun or are familiar with real semi-auto pistols in general, will frustrate the sophisticated shooter. However none of the above cause regret in the purchase. What others should know: The CO2 to Shot ratio feels good. The magazine is intuitive for loading insertion and removal. Care does need to be exercised when "dropping" the magazine, however as I bounced it off the ground a few times. I will circle back on this review after further experience with this gun. So far, 5 CO2 canisters and about 250 shots through it and one "f-ed" up zombie knock over target. Things I liked: I like the look, the feel of metal, the trigger itself, the accessory rail, the threaded and rifled barrel. I didn't find a way to check if the barrel is rifled or not so far. What others should know: Please p226 owners let me know if your pistol has loose or fixed barrel like I mentioned above to make sure is not on mine only. Mine wobbles around like a bucket of bolts. Things I liked: So far so good. Feels great and shots consistently. Nice weight. Things I would have changed: Make it easier to disassemble. PI have a modification that should not void the one year warranty. All that is needed is Electricians Tape (black)! Tape the slide to the frame of the pistol by the picatany being care not to block the front sight. This as you figured out the pistol no longer works single action! It has a very smoothed double action feel. My Sig P226 went from 45 rounds out of a co2 to 80 shots. I have not shot mine much but I'm used to shooting double action. My Beretta 92 is double action so I'm used to it. No jams and more shots out of a co2 I will definitely take it! I turned a piece of junk into a inspiration!!!! Things I liked: Had been wanting one of these since they first were released. Waited until now when I learned that some past issues don't seem to be present anymore. So, the first thing that stands out on this airgun is the accurate reproduction of the CO2 version to the actual firearm. Same feel, same weight, same balance. Nice! The next thing that is noticeable is the strong blowback. It really kicks hard ! Nicer! I honestly found the accuracy very good providing 1.25 inch groups from a distance of 12 feet free hand with H&N Diabolo Wadcutter pellets. Nicest! Things I would have changed: Not much really. But would have been near perfect if there were an ejection port cut-out in the slide...like the Bigger Brother: Sig Sauer P226 X-Five CO2 version. This would have brought 'realism' up a notch. For example, the Beretta Px4 Strom CO2 pellet air pistol that has a similar mag. design has the cut-out feature in its slide. What others should know: The CO2 capsule loading and cam design lever to assist in puncturing the capsule is going to be prone to wear. Caution also should be taken when inserting the capsule 'head first' and then snugging the lever slowly against the bottom of the capsule before squeezing the lever home. This must be done without hesitating during the sequence or else the capsule may bind up and the CO2 will escape. I applied some silicone airgun grease on the contact surfaces of the "cam" to provide less friction and reduce wear. 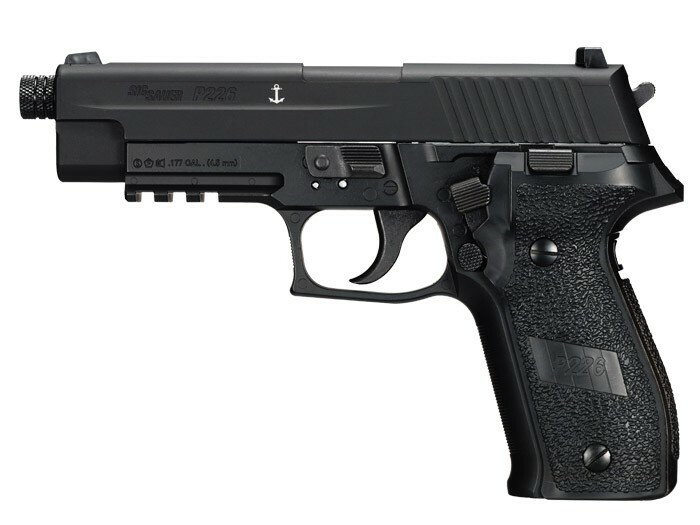 I am very glad I have added the Sig Sauer P226 Mk-25 CO2 pellet pistol to my collection. Things I liked: Liked the look and feel of this gun...the blow back lends to the reality. What others should know: Like this gun....fun to "plink" with but not real accurate and no adjustment on sights. Fun but much prefer my Crosman 2240 for accuracy and hitting power...( and costs less to buy). Good "pretend" gun. Things I liked: All metal construction is always a plus, the co2 loading method is a great idea, the picatinny rail (cause brother you're gonna need it!). Things I would have changed: Where to start? The gun redefines the term CO2 hog! I was lucky to get 24 pellets down RANGE before the noticeable drop in performance. It's needlessly heavy and horribly inaccurate without a laser sight. I HATE that little knurled deal at the front. What others should know: I vacillated between this and the 250 for a long time but bought this because it was all metal. The 250 is a MUCH better gun though that's not saying much.